The President of India has conferred the Ati Vishisht Seva Medal (AVSM) to Rear Admiral MP Muralidharan, the Commandant of the Indian Naval Academy, Ezhimala. An alumnus of the National Defence Academy, Rear Admiral Muralidharan was commissioned in the Indian Navy on 01 Jan 1975. A specialist in Navigation and Direction, he has held a mix of operational and staff appointments. Amongst the operational appointments held are the commands of Indian Naval Ships Chatak, Sharda and Ranvijay, Fleet Operations Officer of Western Fleet and Principal Director of Naval Operations. The Admiral a recipient of the Nao Sena Medal has also served as Naval Attaché at Embassy of India, at Moscow. 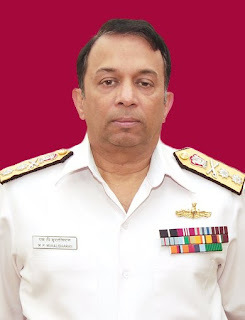 On promotion to the rank of Rear Admiral, he was appointed as Flag Officer Sea Training at Kochi, Chief of Staff, Western Naval Command, Mumbai and thereafter as Flag Officer Commanding Maharashtra and Gujarat Naval Area. Rear Admiral Muraleedharan a resident of Vennala Kochi assumed charge as Commandant Naval Academy in December 2008.